With the help of our professionals, we are able to offer ACM Grinding Mill that are used for crushing and selecting the hard, fragile, pliable but tough, light and loosen material. Extensively used in Powder Coating, Medicine, Dyeing, Food Production, Chemical Refinery and Ceramics Refinery, these are widely appreciated for their precise functions and efficiency. ACM Grinding Mill are designed specifically for continuous output range of 80 to 350 kg/ hr and determining the operating parameters for larger ACM Mills, in combination with Screw Feeding, high efficiency Cyclone, Dust Collector unit and Control Panel & all contact parts constructed in Stainless Steel. This Mill is particularly useful for applications that require frequent product change as it can be cleaned within 60 minutes because of the fast opening of each group. 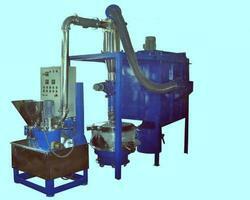 Looking for ACM Grinding Mill plant ?